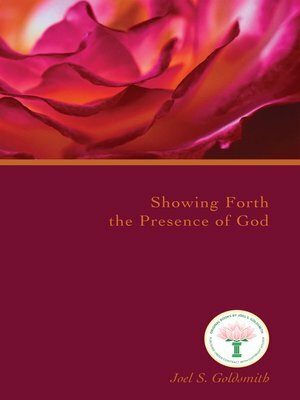 The theme and focus of Showing Forth the Presence of God is at the heart of the message of The Infinite Way: that within each of us dwells a living and immediate Presence, the Spirit of God, which is "closer than breathing and nearer than hands and feet." Chapter by chapter, the author unfolds insightful, practical instruction on how to discover this Presence within and let it show forth. He illustrates with great care how this awareness will generate a new vitality and freedom in our day-to-day affairs. "It is the nature of God that we be free. It is the nature of God that we be whole," Goldsmith exclaims, and then goes on to emphasize who "we" are. "The son of God is more than a man who lived two thousand years ago; the son of God is the Spirit of God that dwelt in the man Jesus, and that dwells in every man. Therefore, the son of God is present in you and me." Discovering that Son of God within us and knowing what it means to express that in our daily life is the message of this book. Recognizing the truth that we are sons of God, we come to realize that the universe is not outside of us, but is embodied within our consciousness. "There is no selfhood apart from God," Goldsmith explains, "nor is there a creation apart from God. What we call a material creation is not a material creation: it is a material sense of creation....everything in this universe answers, responds, and is subject to the divine Consciousness which is God." Showing Forth the Presence of God will help the spiritual seeker understand the momentous implications of that truth.